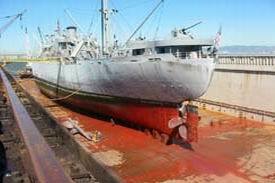 The SS Jeremiah O'Brien is one of the last floating examples of the famous World War II "Liberty Ship". Located at Pier 45 San Francisco, CA, the vessel is an operational floating museum. The German Navy's strategy during the Battle of the Atlantic was to sink supply ships bound for Great Britain faster than they could be built, thus starving the island nation into surrender. Desperately England turned to America for help in building more ships to maintain her struggle against Nazi Germany. They brought with them a proven design having adequate horsepower and carrying capacity that could be modified for mass production. America became the "Arsenal of Democracy and eventually eighteen ship yards built Liberty ships with a large part of the workforce being women. American ingenuity devised new fabrication techniques that cut delivery time from 110 days to an average of 40 days for the new vessel. These ships were critical in winning the war. 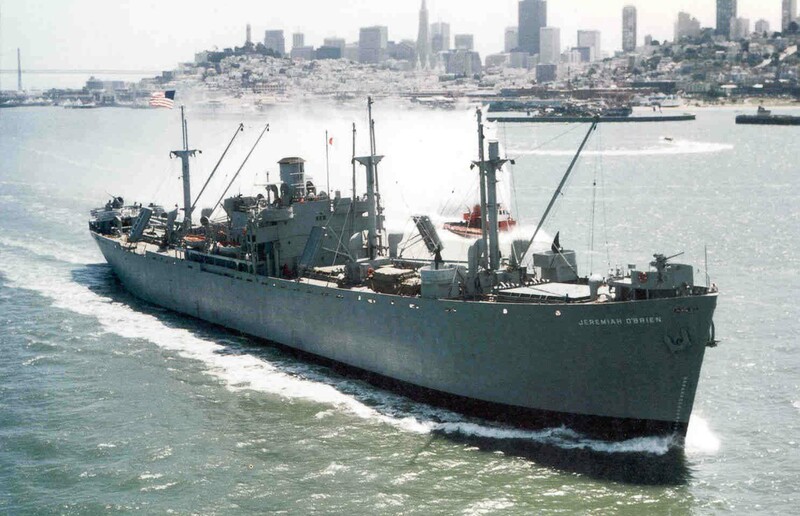 The S.S. Jeremiah O'Brien was built in 56 days and launched on June 19th, 1943. She made four voyages in convoys between the U.S. and Great Britain. On her fourth voyage she was diverted into a shuttle run between England and the D-Day Normandy beachheads of Omaha and Utah . She made 11 such trips fighting off enemy aircraft two bomb and one torpedo attacks. On her last voyage in January 1946 she carried Australian war brides to the U.S. to join their new American husbands. These perspective images are back linked from many of the Shipwreck Museum's vessels to give an historic prospective of what merchant ships of this era originally looked like. (l) Ship ID plaque; (r) Bows of a Liberty ship. (l) Bow, gun, & anchor; (r) Gun tub, stack and amidships deckhouse. (l) Stern, screw & rudder; (r) 3 inch anti-ship gun. (l) Anti-aircraft gun in tub; (r) Oerliken anti-aircraft gun. (l) Engine room sky lights; (r) Skylight hatches and vent scoops. (l) Skylight hatches from inside engine room; (r) Ship compartment ladder. (l) Engine cylinders; (r) Engine room cylinders. (l) Ship electrical console; (r) Work bench . (l) Engine wrenches; (r) Pressure gauges. (l) Chain hoists; (r) Engine drive shaft piston. (l) Steam boiler; (r) Engine order telegraph. (l) Hold, cargo winches & booms; (r) Cargo winch. (l) Aft cargo & steering winch; (r) Cargo winch. (l) Anchor windlass; (r) Anchor chain & hawespipe. (l) Bow sprit and flag staff; (r) Cargo mast. (l) Smoke stack; (r) Mooring bullards & line. (l) Weather bridge conning helm; (r) Alarm switch. (l) Spare anchor; (r) Hoisting davit. (l) Ship's main helm ; (r) Compass binnacle. (l) Porthole & deadlight. ; (r) Bridge speaking tubes. (l) Radio console; (r) Caged light. (l) 6 x 6 US Army truck; (r) Steering wheel.